This Saturday is the big day! Fans of the series will probably know already, but this Saturday The Hunger Games comes out in DVD. I am so excited. Beyond excited. Now we can all stop watching the crappy cinema cam version we've all been clinging to after emptying our pockets at the cinema. We can relive the experience without people walking past the screen or laughing or whooping at inappropriate times. So good. 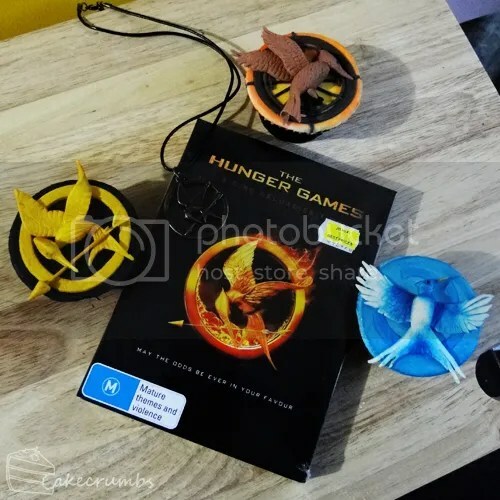 The DVD release coincides with my very first weekend off in a long time, so I will be spending it sobbing into my popcorn over The Hunger Games and the loss of favourite characters. I was so excited I decided to celebrate – with cupcakes! 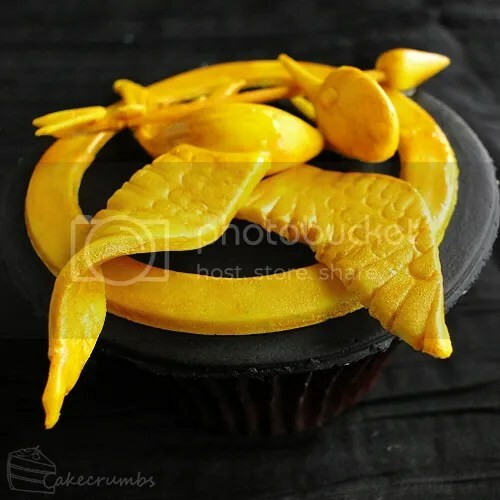 I wasn't really happy with how the mockingjay pin cupcake come out on my first attempt when I made the Hunger Games cupcakes, so any excuse to give this another go was a welcome one. This post is gonna be really pic heavy, you guys. I spent so long making these that I can't resist showing you all every little detail. Let's begin with some progress pics. 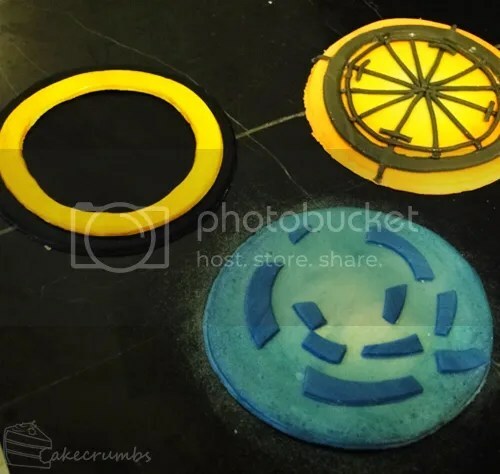 The first step for the cupcake toppers was to make their backgrounds. Tick tock, this is a clock. I made each of the mockingjays different ways. Here's one of them before being painted. The first one came from the first book, The Hunger Games. I have the special edition version of this book and was tempted to do the new mockingjay art, but I'm so in love with the pin I opted to retry it. Unlike the other two, this artwork depicts an object, rather than a living bird. So the eyes are just gold spheres and there are no feet. 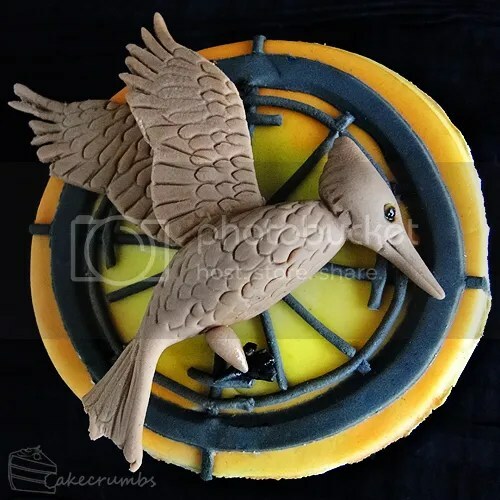 Both the mockingjay and the background are white fondant painted, mainly because I couldn't be bothered kneading the colouring in for hours on end! Ideally, I would have liked to make the wings from individual feathers, but attempts to do that were lengthy or too bulky for such a small topper, so I opted for indenting them instead. Not perfect, but an improvement from last time, I think. The next is the Catching Fire mockingjay. This one is supposed to look more real-life than the pin. My version certainly isn't as elegant as the cover art, but I still had lots of fun making it. 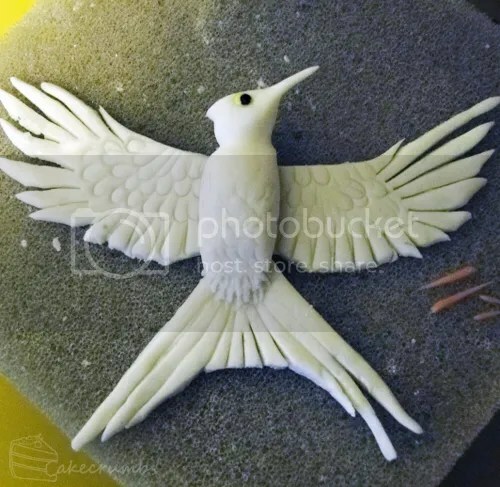 This mockingjay has eyes and feet — the latter of which were terrible to do. I'll definitely try it a new way next time. This mockingjay gorgeous primary feathers that extend like fingertips. The wings are my favourite part of this mockingjay on the cover art, so I hoped to do them some justice. 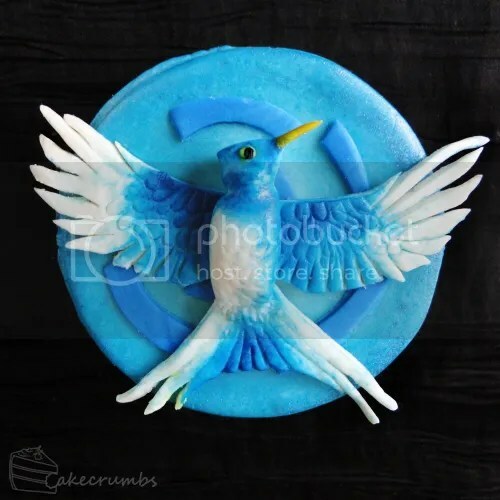 And lastly, we have the Mockingjay mockingjay. This one is my favourite artwork of all the covers. The first two I made largely by making all their components separately and joining them together. But for this it was done as two pieces. 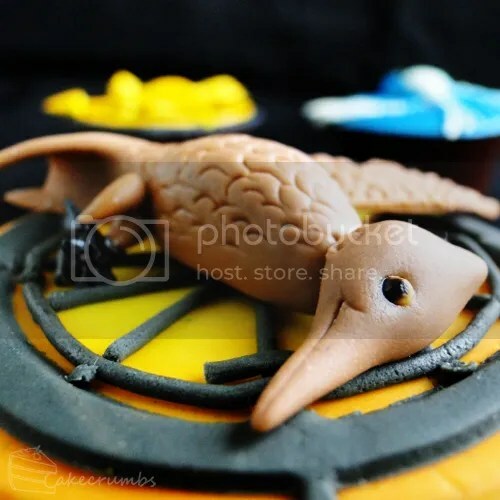 Shaping the entire body and tail was a challenge for something that dries as quickly as fondant. I made feet for it (the parts of which can been seen next to it in the progress pics) but opted to leave them off. They just looked so distracting and, unlike the Catching Fire mockingjay, are not a prominent feature in the artwork. The colour was also a challenge. On the cover art, they're more shadow rather than markings, so it was difficult to decide how to approach it. It's also bluer in some versions of the cover. 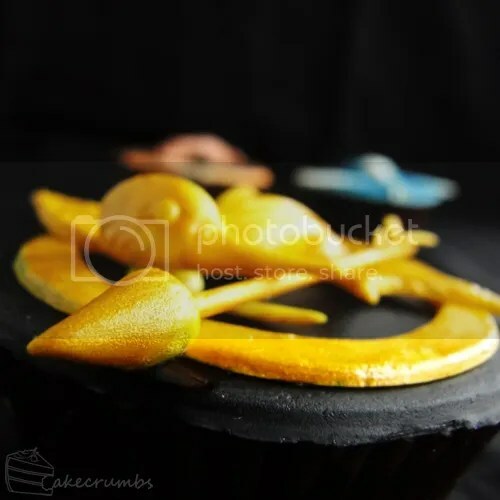 I used a combination of lustre dust and diluted food colouring to achieve this look. 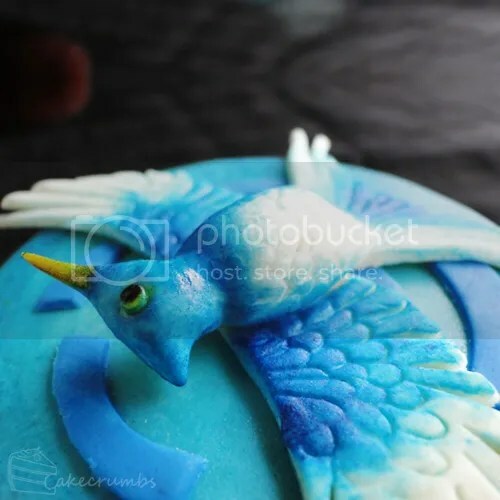 My favourite part was making the wings. 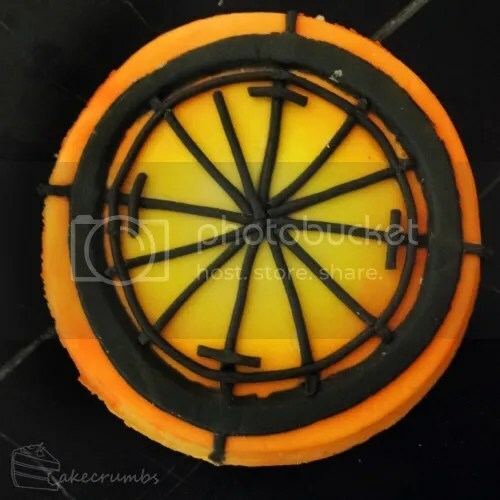 I hope I get the opportunity to try these again in future so I can improve on techniques here. They're awesome fun to make. [ETA]: Yay! 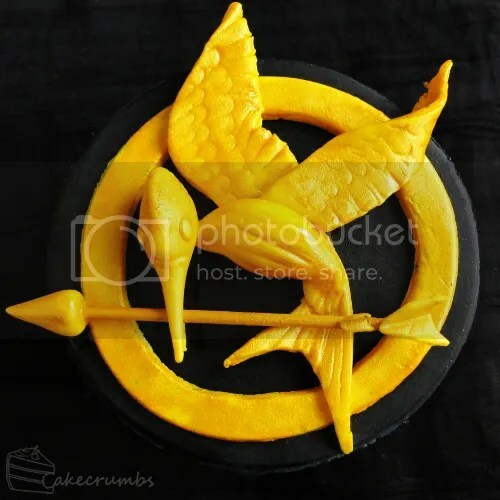 Hunger Games celabratoryness! These look great. I’m always amazed at how much tiny detail you can achieve. 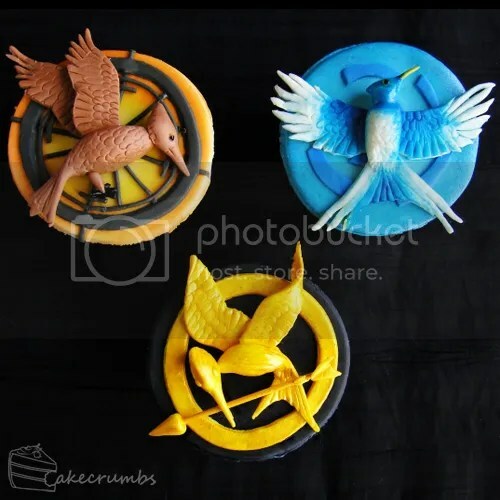 Omg, I thought your FB update was about the last Hunger Games cupcakes you made. These are all just…. wow. 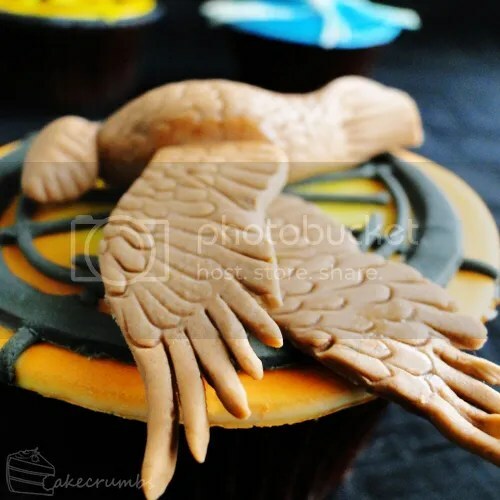 Especially that pin one… I don’t think i could get fondant so thin and tiny without breaking it! I’m also pleased that you love the mockingjay as much as I do; I have the pin on my bag strap! Aw, thanks so much. ♥ I had so many breakages. 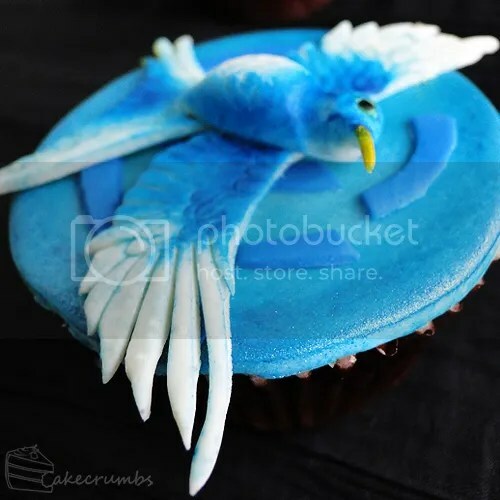 And, because I am an idiot, when I was leaving them dry overnight I put some clothes in the dryer I needed for the nest day and the humidity got to the fondant and it sagged all over the place haha. GAH. I had to do SO many repair job it’s not funny. WOW. I love all the details! These are UNREAL! I am beyond impressed. And I can’t imagine ever eating anything so perfect! Thank you. ♥ We haven’t eaten them haha. I think I might end up just preserving the toppers. 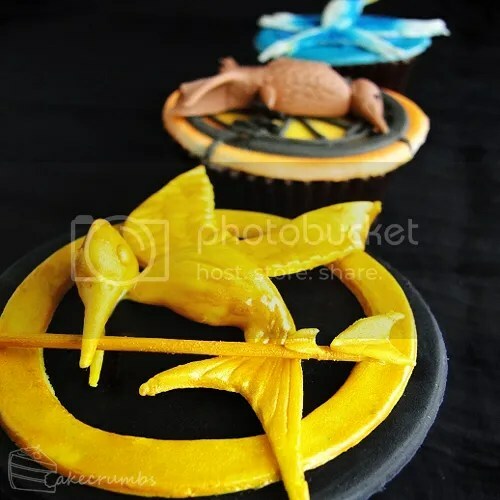 Pingback: 25 DIY Ways To Get Ready For “Catching Fire" | シ最愛遲到. !